I greatly admire author Cathy Davidson, and I very much wanted to love this book, but sadly I don’t. Now You See It comes from an exciting intellect, a scholar and an academic, a sparkling enthusiast and vigorous advocate for the “new learning” modes that my blog here promotes and celebrates. Davidson’s focus is the university, and as a Vice Provost at Duke she led that university forward in meaningful and important ways; now at HASTAC she is clearly one of the nation’s most important educational thinkers and innovators in her work seeking to transform learning to modes that are contemporary, relevant, engaging, and preparatory for students. So why I am so disappointed in the book? As I’ve reflected about it, I think my main sadness is that in her advocacy for students being online and networked, and in her defense against what we all can recognize has been at times a loud and emphatic backlash against the problems of multi-tasking and digital distraction, she seems to work so hard to defend her turf that she allows for no compromise, no middle path, no synthesis, and the extremism of her position and/or rhetoric undermine her very argument and what are our shared goals. There are terrific elements in the book. She relates exciting educational innovations that she helped to pioneer at Duke; I am very inspired by the way she implemented the iPod experiment with undergrads at Duke, a “calculated exercise in disruption, distraction, and difference,” and the great advances in creativity, collaboration, and communication that unfolded as a result. Having my students blog was a no-brainer; their writing online, at least in their blogs, was incomparably better that in the traditional term papers they wrote for class… Research indicates that at every age level, people take their writing more seriously when it will be evaluated by peers than when it is judged by teachers. Online blogs directed at peers exhibit fewer typographical and factual errors, less plagiarism, and generally better, more elegant, and persuasive prose than classroom assignments by the same writers… [Stanford research finds] students becoming more literate, rhetorically dexterous, and fluent, not less, as feared. She shares interestingly, if a bit pridefully (“it wasn’t just a class; it was a different way of seeing: we’d seen a transformation not just in the classroom but in all of us”) about her own curricular innovation in teaching a course entitled “This is Your Brain on the Internet,” a course I’d love to take. She has her eye on rethinking assessment (“if you measure narrowly, you see results just as narrowly, our educational vision has shrunk to the tiny bubble of a multiple choice exam”), asking good questions about whether we are effectively measuring student learning, giving students useful feedback with assessment, and whether are unfortunately undermining our educational goals with inappropriate testing and measurement. During boundless, wandering thinking, we open ourselves to possibilities for innovative solutions that, in more focused thinking, we might prematurely preclude as unrealistic… What if we thought of new digital ways of thinking not as multi-tasking but as multi-inspiring, as potentially creative disruption of usual thought patterns? I similarly value her perception that we all will learn more and think more creatively and powerfully if we tap into, regularly, online learning networks. Is the form of learning and knowledge making we are instilling in our children useful to their future? The Internet it here to stay. Are we teaching them in a way that will prepare them for a world of learning and for human relationships in which they interweave their interests into the vast, decentralized, yet entirely interconnected content online? The answer more often that not is no. I believe that many kids today are doing a better job preparing themselves for their futures than we have done providing them with the institutions to help them. In the end, distraction is one of the best tools for innovation we have at our disposal– for changing out of the pattern of attention and beginning the process of learning new patterns. The book’s central and guiding metaphor comes from the well-known video of college students passing basketballs, used in experiments by scientists of attention in which they ask participants to count the number of passes made in a 90 second period. If you haven’t seen it before, or heard about it, do take the time now to watch, paying close attention and counting the number of times balls are passed. The reporting from the widely conducted research is that all-too-frequently, when participants are asked afterwards about the video, they report seeing nothing strange or surprising: they don’t see the gorilla. Did you? And if you didn’t, what do you think about the fact that you didn’t? Is it a serious problem that you didn’t see the gorilla? Does it mean you suffer an attention blindness crisis? Does it suggest your powers of concentration are too strong? No? I don’t think so either. But Davidson, if I read her correctly, does so think. This becomes Davidson’s thesis: in a 20th century paradigm of “attention,” we don’t see the gorilla, and that is a problem bordering on a crisis; in our increasingly information saturated environments, it is ever more imperative that we all see the gorilla. The metaphor even extends to her book cover (go look at it again). What she is calling for is a 21st century, internet era, paradigm of attention, one in which we have the kind of wider-ranging attention mode in which we see the balls being passed and we see the gorilla, and her response to every critic of multi-tasking and divided attention seems to be that any such criticsm is bound up in an antiquated concept of focused attention necessary in 20th century workplaces and universities but now detrimental in our fast-moving, fast-changing times. For well over a hundred years, our culture’s story line has been about focused, measurable productivity… sorting our day into the “on” times for our attentive labor and the “off” times for our leisure. Incongruity, disruption, and disorientation may well turn out to be the most inspiring, creative, and productive forces one can add to the workplace… In a diverse, interconnected, and changing world, being distracted from our business as usual may not be a downside but the key to success. I just can’t accept the idea that we don’t want for ourselves and for our students times of focus, of concentration, of freedom from distraction, of deeper thinking and strong attention. It brings to mind my frustration with the essay by William Deresiewicz arguing against social media and for isolation as essential for leadership, scholarship, and creativity. In responding to that, I made the case contra Deresiewicz that it is enormously valuable to network, to multi-task, to “surf,” in order to create, think and innovate. But with Davidson, the argument is the inverse; we do need to focus and concentrate in addition to networking and multi-tasking. Davidson is right that we’d be wrong to narrow our attention all the time, to concentrate too much of the time to the exclusion of welcoming new information. But some of the time, we need to focus. Some of the time, our purpose and goal is not to be open to seeing the gorilla; rather, some of the time, our purpose and goal is to count the basketball passes, darn it. Davidson does, partially, acknowledge this in a problematic, mixed message paragraph in the conclusion. In most of life, our attention is continuous and partial until we’re so forcefully grabbed by something that we shut out everything else. Those blissful episodes of concentrated, undistracted, continuous absorption are delicious– and dangerous. That’s when we miss the gorilla— and everything else. The lesson of attention blindness is that sole, concentrated, direct, centralized attention to one task– the ideal of twentieth century productivity– is efficient for the task on which you are concentrating but it shuts out the other things we also need to be seeing. As she says, “centralized attention” is indeed “efficient for the task on which you are concentrating,” and efficient task-management is something we should all want for ourselves and our students– so long as we work in tandem to ensure we and they have many an opportunity to “see” what otherwise we might be shutting out. But (and I know I am often guilty of the same, so my only defense is to say it takes one to know one), I can only infer and conclude she let her enthusiasms get the better of her and let her rhetoric soar beyond reasonable bounds. Perhaps this is, and I think I hope it is, purely rhetorical excess– deeply problematic and damaging rhetorical excess– and that it is all it is. Because if this is a position she holds sincerely and firmly, I have to say, not from the authority of a brain-science scholar but rather only a common sense educator, I think she is entirely mistaken. 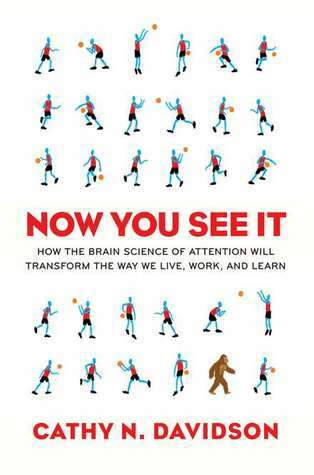 Her book “Now You See It” celebrates the brain as a lean, mean, adaptive multitasking machine that — with proper care and feeding — can do much more than our hidebound institutions demand of it. Davidson’s book is subtitled “How the Brain Science of Attention Will Transform the Way We Live, Work, and Learn,” but there is almost no brain science in the book at all, and attention is invoked mainly as a metaphor. Davidson is so taken with the [unseen gorilla study and the inattentional blindness] phenomenon that she proclaims it “the fundamental structuring principle of the brain.” Inattentional blindness (as it is properly called) is an important and counterintuitive fact about how perception works, but even I don’t think it can carry half as much weight as Davidson loads upon it. It’s a shame Davidson decided to wrap her ideas in neurobabble, since she has some interesting first-person reports to make on schools and businesses that have adopted innovative practices like complex simulation and strategy games. In one classroom she visits, the students organize themselves into teams and compete to design and build bridges out of Popsicle sticks, developing management plans, doing experiments on structural strength and making financial decisions along the way. Indeed, Davidson is such a good storyteller, and her characters are so well drawn, it’s easy to overlook the lack of hard evidence in favor of the intriguing ideas she advocates. Let me conclude by agreeing wholeheartedly with the above paragraphs. Now You See It is in many, many ways a wonderful book about educational innovation and “intriguing ideas.” I crave the opportunity to pull those sections out and see a different book emerge, about the powerfully engaging and critically important ways learning can realign itself with the internet age. I am especially taken with chapters three and four, including her rich examples of classroom re-invention in “Project Classroom Makeover” and her important discussion about “How We Measure.” But the central and pervasive unseen gorilla organizing metaphor and the argument for distraction haunt the book and weaken its effect and value considerably.